It’s finally fall and finally October so I’ve been going a bit overboard with everything seasonal lately. I type that as I watch Halloween movie classics and sip on a cup of pumpkin chai tea (yup, it’s fall-tactic). Check out some of the products below that I’ve been really loving lately. With the weather starting to get chilly, it’s been getting harder and harder for me to get out of bed in the morning. One of the only things that pushes me out is the thought of getting to make a big mug of David Rio Club Chai tea. I’ve always loved a good chai tea, but I’ve found it hard to find a company that makes a mix to my liking. I like mine a little spicy and very cinnamony. I warm 1 part of the brew with 1 part milk in a small pan and instantly have a chai that tastes just like I had a barista whip up the perfect one for me everytime. SO GOOD. When I’m at work, it seems like everyone has their headphones on all day and I can understand why. It makes it so much easier to get through your daily workload when you get into that zone where you can block out everything else. Lately though, my headphones just haven’t been getting it. I have been using the white in ear headphones that came with my iPhone and I don’t know about you, but after awhile those definitely start to hurt my ears. As someone who just needs to plug in, zone everyone else out and just get stuff done, this didn’t work for me so I finally invested the money to get an amazing pair of headphones. After some tech chat with a few friends and my boyfriend, I was convinced to get the Bang & Olufsen H8 Headphones. They’re bluetooth enabled and wireless with a built in mic, great noise canceling capabilities and they have touch gestures on the side that let me change songs, pause and control the volume without ever touching my phone. All in all, they’re pretty amazing and if you’re looking to invest in a really good pair of headphones, you should definitely check them out. They’re pricey, but hey you’re ears are worth it! The bipolar weather we have been having in San Francisco has been really playing a number on my skin. 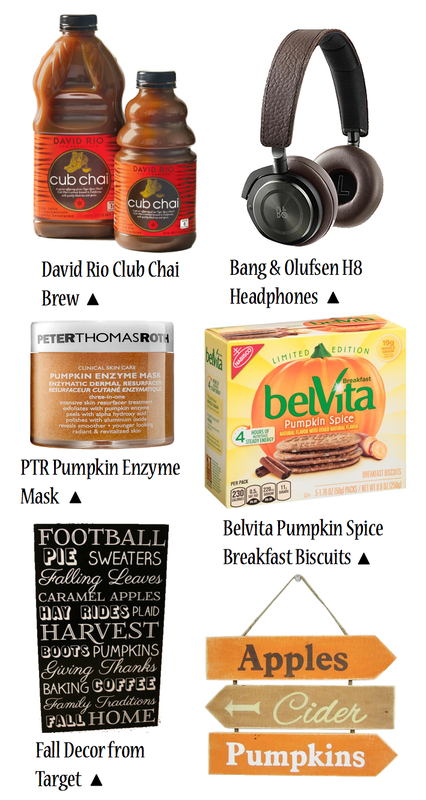 The only thing that seems to be keeping it under any kind of control lately is the PTR Pumpkin Enzyme Mask. It really does smell like pumpkin and I notice the results literally the morning after I use it. The texture and clarity of my skin is just ten times better than it was before. It also comes in a huge tub so it will be a LONG time before I run out which is nice for my wallet. It’s really nice to start my morning at the office with a cup of tea, but what’s been making my morning tea even better lately is the Belvita Pumpkin Spice breakfast biscuits. They’re the perfect breakfast on the go and they taste amazing. I’ve tried a bunch of the flavors, but I have to say my current addiction is the pumpkin spice seasonal one. I could a whole box in no time at all. I’ve been so excited that it’s finally fall and finally October, but I’ve been so busy lately that I hadn’t had anytime to decorate and when I did pull them out, I found my decorations to be severely lacking. Thankfully, my sister and I had planned a trip to Target and I was able to find the cutest fall decor pieces and all under $5! Seriously, one of the most expensive pieces of decor I found was a the $3 black typography sign below so I was able to stock up on a ton of cute pieces without breaking the bank. If you haven’t checked out your local Target yet for cute fall decor, you definitely need to, like now. What have you been loving lately? Share with me in the comments below! I love belvita, haven't seen the pumpkin ones though, sounds delicious! The pumpkin mask sounds like a good find too. I've enjoyed those pumpkin bevita biscuits too! And that sign is really cute. Love to try your pumpkin mask and love those breakfast biscuits too!